The Traditional Chinese version of KINGDOM HEARTS Union X officially launched in Hong Kong, Taiwan and Macau on January 25th, 2018. The Kingdom Hearts series purportedly does not have a large audience in these locations, so the announcement of a third version of the game specifically targeting this region came as quite a surprise. An official Facebook page was created to deliver announcements of new content, such as story updates, new medals and collaborative events. However, these updates abruptly stopped in May 2018, and the game has remained at a standstill ever since. 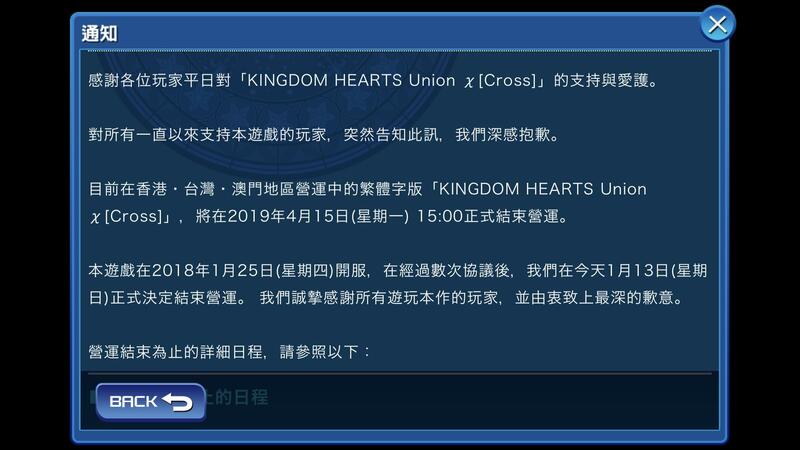 The Traditional Chinese version of KH Union X will be terminated on April 15th, 2019. It's hard to say the writing hasn't been on the wall for some time. Between a lack of interest and small userbase, it simply wasn't worth it to keep the game running any further. However, players should not take the termination of this version as a sign of things to come for its Japanese and Global counterparts, as they continue to thrive in their third year of operation. At some eventually point this game will shut down everywhere. At which point a big chunk of the series lore becomes impossible for anyone to experience first hand. Honestly, still not reassured with them still not even trying to catch us up to jp, and the lack of voiced medals. Just feels like they're doing bare minimum with global. The only way I'll feel confident in them is if we're caught up to jp other then medals, so it feels like they care about global. Regardless of how you may feel about the way the game is being managed, it's still successful. Loads of players want so badly for it to perform badly to validate their feelings for it, but that won't be the case. SE could have made us a Ubisoft: Completely remove Winnie for all versions.